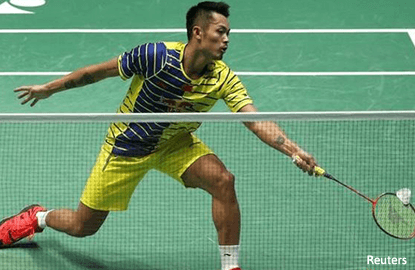 BIRMINGHAM (March 13): China's Lin Dan will attempt to become the fourth player to land six All-England Championship men's singles titles after beating Xue Song on Saturday to secure his berth in the final. The fifth seed came back from a game down for the third match in succession to oust his younger compatriot Xue 18-21 21-15 21-9 and next meets Tian Houwei in another all-Chinese showdown. Sunday's match takes on extra prominence with Lin two places ahead of Tian in the Race to Rio standings and the qualifying process concluding in May. "The competition is never ending in the Olympic quest," Lin told reporters after reaching the final for the first time since 2012. "There are many great players in China who are trying to get there (in August)." The 32-year-old said his fitness and "physical reserves" were key against Xue. Lin was happy to keep rallies alive, rarely going for attacking winners, and eventually wore his opponent down. Should Lin triumph on Sunday he will join Ireland's Frank Devlin, Denmark's Erland Kops and Indonesia's Rudy Hartono with six or more All-England titles. Tian beat Dane Hans-Kristian Vittinghus 15-21 21-14 21-14 and then said he would treat Lin like "a normal opponent" in the final. Nozomi Okuhara is one win away from becoming the first Japanese champion in the women's singles since 1977 after ousting Carolina Marin, the world champion and title holder. Okuhara overcame top seed Marin 11-21 21-16 21-14 after forcing the Spaniard into a number of mistakes. "I'm aware the target on my back is getting bigger but I am very excited about that," said Okuhara who turns 21 on Sunday. She next faces twice winner Wang Shixian who was not entirely happy despite defeating Tai Tzu Ying of Chinese Taipei 21-23 21-12 21-15. "I'm really not happy with the performance, something went wrong with my tactics today," Shixian said.